I already posted about our experience last night at Teocintle Maiz restaurant in Ajijic, but I’ll memorialize it here because previous posts are easier for me to find on my blog. Last night, we had a magnificent dinner. 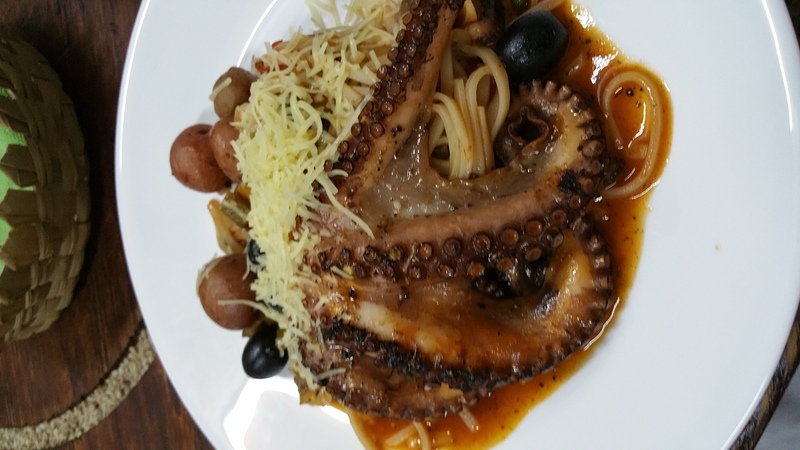 I ordered sauteed octopus. 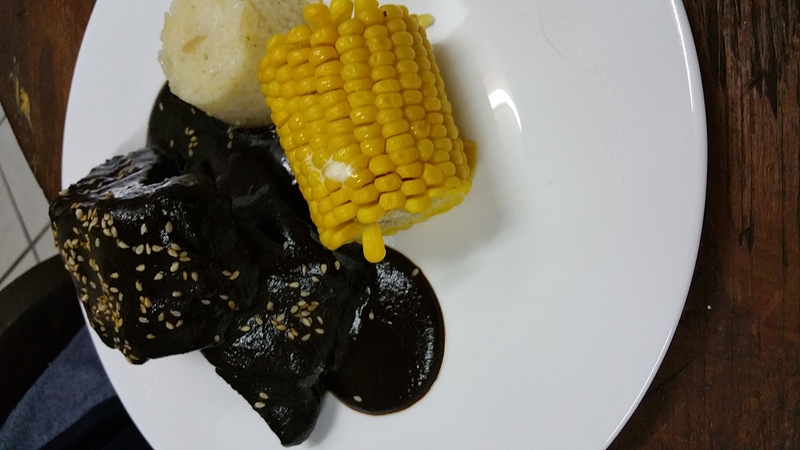 Janine had pork ribs with black mole. 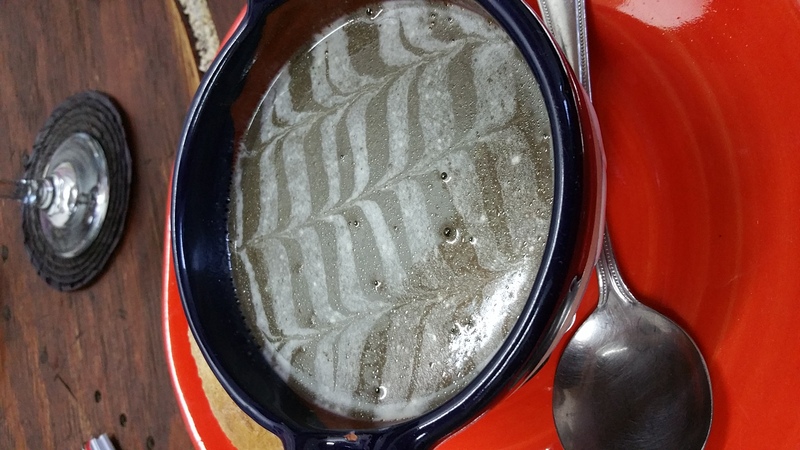 For a starter, I had huitlacoche cream soup. 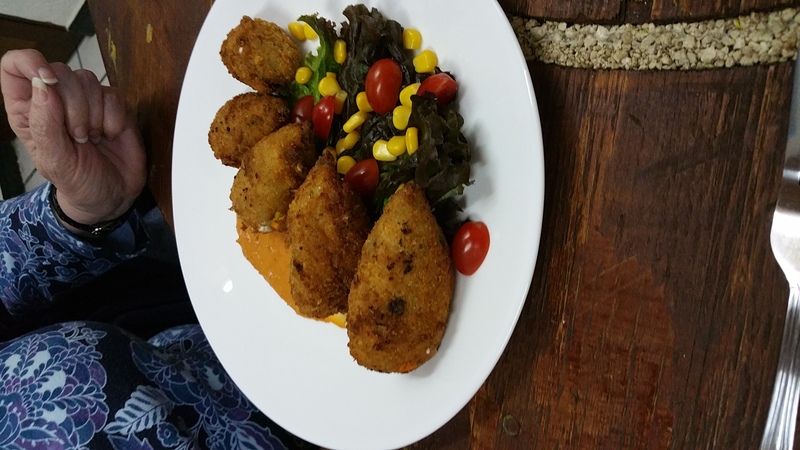 Janine ordered indias vestidas (fresh squash blossoms filled with cream cheese and kernels of corn, then deep-fried). My sister-in-law ordered guacamole for the table and there was more among the four of us. My sister-in-law chose poblano chicken breast for her entre and my brother selected birria de pollo. The entire meal worked out to about $34 US per couple. We started the day’s meals with a visit to a little French-owned pastry shop across the street from a brew-pub we’d eaten lunch the day before. We enjoyed an alfresco breakfast, choosing from among a small but delicious assortment. I had a “traditional” breakfast of eggs over easy with bacon. It came with a hard French roll and a very nice dog begging for food at the table. For a change of pace, I ordered a latte instead of black coffee; I could get hooked. My sister-in-law drove us down to a bank where we withdrew cash from the ATM, then dropped us on the main Ajijic square. Janine and I walked around the village center, pausing occasionally to look inside shops and galleries. 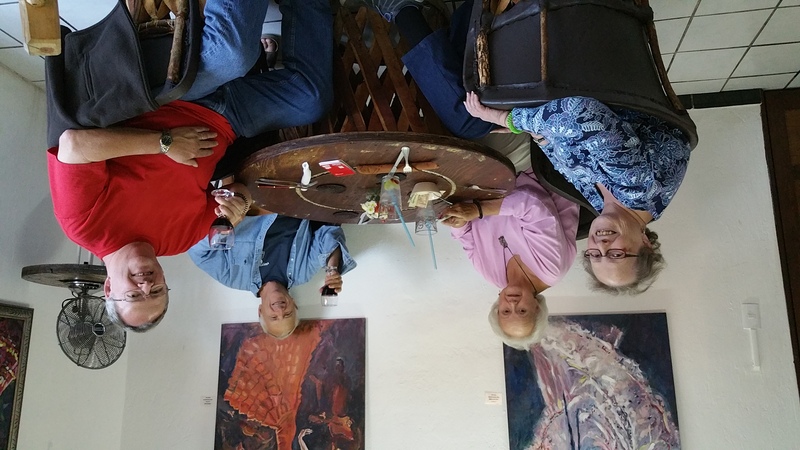 We walked all the way down to Lake Chapala, walked a ways on the malecón, and then wandered to La Nueva Posada, where we had lunch outdoors at the hotel’s restaurant. Ajijic-style fish tacos for me and an interesting chicken curry dish with pineapple for Janine. From there, we drifted back toward the square, expecting to hail a taxi to take us back to the house. Apparently, all the taxi drivers were on siesta, so we hiked home along the carretera; not a long distance (maybe a mile or so), but a very difficult and sometimes dangerous trek over broken concrete, uneven cobblestone, and too near speeding drivers. Still, an interesting adventure! Here are a few photos from our experiences so far. Food and the like. Ha! The dog begging at your table, the scary hike on the carretera due to la siesta! ¡Ya ves, de estilo de vida es casi opuesto como el stuctura de lenguaje, John! Enjoying your travel log!